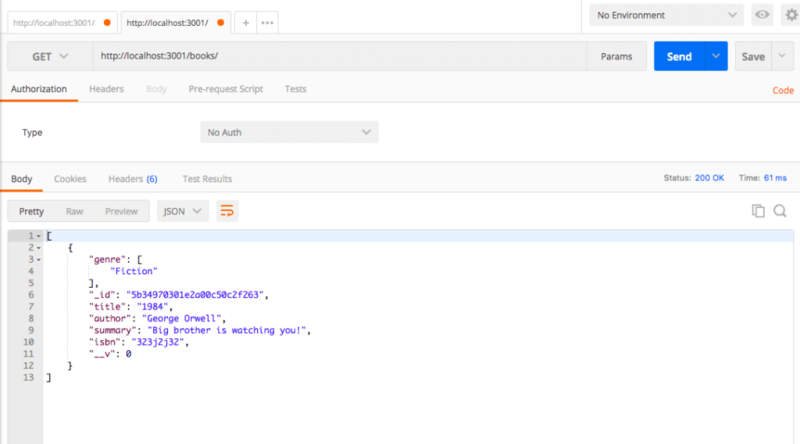 In the previous article, we learned how we can leverage ODM like Mongoose to connect a database to our Express server web application and define schema and model inside our web application to interact with the MongoDB database. In this tutorial, we are going to work on the controller part of our web server. We will be defining some routes using BookSchema. Let us get started. Routes are the backbone of a web application built using a server. Without it, you won’t be building a web app. When I say routes here, I mean server-side routing. There is a vast difference between a server-side route and the client side routing. Routing is the concept in which some snippets of code handle HTTP requests or client requests. It is used for navigating in a web application by clicking on a link which further, changes the URL to provide access to a different endpoint in the application. In server-side routing, whenever the endpoint changes, some form of data is requested by the application. This is the primary purpose of server-side routing. The server will query the database to fulfill the request and sends it as a response. In most Expressjs applications we define our routes in a separate file called `routes.js` which handles the business logic such as database queries. For example, take a look at the GET request that will handle the by fetching the list of items from the database. Server-side routes cause the web application to refresh the page. This means, whenever a GET request is sent to the server, the response always comes back to the client as a new document. This is a resource consuming task. For every request, if there is a full page refresh, some of the same data will be transferred back and forth such as the header of the application. Refreshing a page takes time and consumes network resources. This is why we need client-side routing to navigate for different resources, avoiding the web pages to update again and again. Routes help developers to maintain and scale an application by keeping different endpoints and the business logic behind them as separate concerns. In an Expressjs app, all routes defined must be invoked before the function call of app.listen(). HTTP is a standard protocol for a client and a server to communicate over. It provides different verbs or methods such as GET, POST, PUT, DELETE, PATCH to communicate with the client. Each route in an Express application has a handler that is responsible for sending the response from the server whenever the route is invoked as a URL by the client. The example above uses the `.get()` method to respond to HTTP GET requests with a certain path (in this case `/`). Other HTTP verbs provided to us are post(), put(), delete(), options(), trace(), copy(), lock(), mkcol(), move(), purge(), propfind(), proppatch(), unlock(), report(), mkactivity(), checkout(), merge(), m-search(), notify(), subscribe(), unsubscribe(), patch(), search(), and connect(). A routing function is a combination of a route path and a callback handler, that is responsible for sending the response from the server. This callback function takes three arguments that will contain an HTTP Request object, an HTTP response, and the next function in the middleware chain. The route paths are defined as endpoints at which requests from a client can be made. When we implement the controller of our application, you will see that we will be defining a route path for the existing database model called `/books`. Routing paths can be strings, string patterns, or regular expressions. Take a look at the example below. We are defining a route path called `/about` in first and using wild characters in the second which indeed signifies that it is a combination of string patterns and regular expressions and in the third one we only use a wild character to mean that it is a 404 route. In the above route example, we can access the `bookId` from `req.params.bookId`. This will be equal to the actual URL: `http://localhost:3000/books/43`. In this section, we will be creating routes for our web server application. Instead of creating routes in `app.js` we will be defining them in the routes directory. Also, we will be using an instance of `express.Router()` instead of `app.HTTPmethod`. It works similarly and has access to every HTTP method provided. To start, create a new file called books.js inside routes directory. In this file, we are only going to define the endpoints related to our model. These endpoints are URLs through which any client can send a request to our Express based web server. These routes are all set up on the Router instance which is then exported from express() itself. The whole router instance from each file then can be invoked inside app.js file to make it work. We will see how to get the routes working later in this tutorial. The business logic behind each of these endpoints is a callback function or a routing function that will process the incoming request will be handled in a separate file called booksController.js under a separate directory called controllers. You will have to create that at the root of the project. 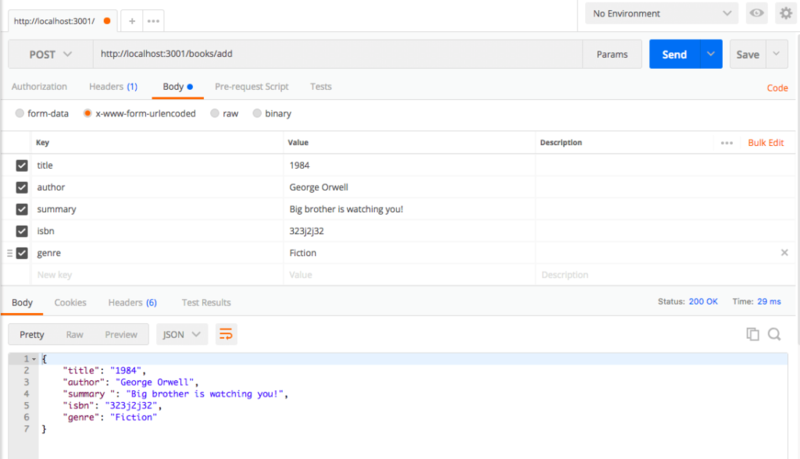 Open booksController.js and start by import the database model for books. Now we will require our routes file in app.js after all middleware functions. 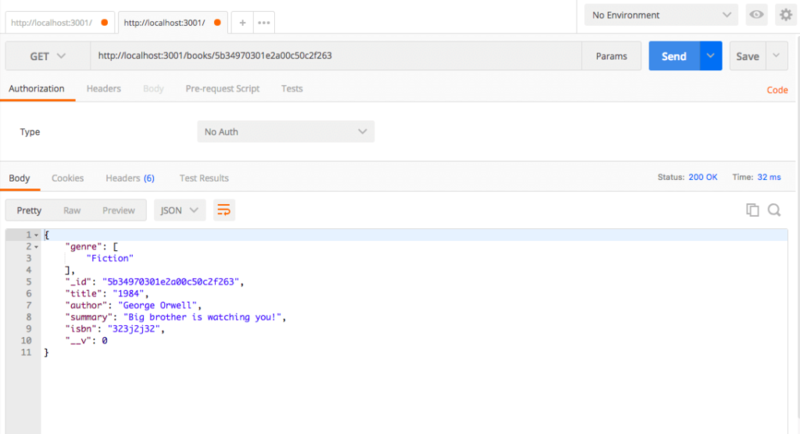 Now open a REST client like POSTMAN and visit the URL: `http://localhost:3001/books`. You will see the below message printed because that is what we are currently sending from business logic or controller associated with the particular route. are not using any third party library to do so. Now to see if the data is saved in the database, we will fetch by using the `/` route. See the screenshots below and if you get the output and no error that means your routes are working great! This completes our fourth part in the series. Stay tuned for more. You can find the source code for at this Github repo under tag `chapter4`.